The Poet Laura-eate: The Last Post...? Four years ago I penned a posting entitled Renaissance of the Victorian Internet about how many Victorians enjoyed three postal deliveries a day - Breakfast, lunch and teatime. In most towns and cities it was possible to post a letter in the morning and receive a reply by teatime, or even by return of post! The Victorian postman would go as far as to take any waiting return letters for you if it was inconvenient for you to visit your nearest post box (of which there would be one on almost every corner in most towns and cities).. I later wrote about The Power of Postcards and how this mode of communication helped win World War I. At the weekend my partner and I traipsed around a CITY CENTRE in ever despairing search of one of these to post a birthday card. Finally we found one at the railway station. Later, in Battersea's Nine Elms, we were shocked to find out the fate of the South London Sorting Office. No oil painting of a building for sure but to be torn down within only twenty years of construction. What a scandalous waste of public money. 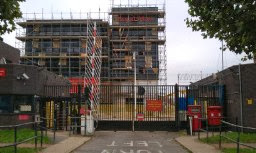 The 'site' has now been sold to greedy developers to boost the value of Royal Mail prior to privatisation. Only a small proportion of the housing for this sacrifice will be 'affordable', presumably meaning the vast majority will be 'unaffordable'. Funny how mention of 'affordable housing' is used to gloss over innumerable moral questions and justify the non-involvement of local communities in their own future. Then again the whole of Vauxhall resembled a post-apolocolyptic wasteland, except for some shiny new conciege-minded monstrosities towering over the tube station. Now it has come to the point where the Post Office is being sold off, despite opposition in many quarters, including from its own Parcelforce division. Small investors are expected to shun the sell-off in particular. I don't know about you but I don't recall giving my consent for the privatisation of a public service. Small companies are already suffering in particular through an increasingly slow and unreliable postal system. Some have even gone to the wall as a result.. Only recently I had to phone Royal Mail to complain that the main letter box outside my workplace had evidently not been emptied for days and was now so full, letters were trying to drop out of it. The Victorians must be turning in their graves at what we have done to their once proud world-beating postal service. So what's it to be? Do we take to the streets to protest or vow to start writing more letters and cards? Addictive as the internet can be, I for one am increasingly keen to keep real life real, and have just purchased a bulk consignment of notelets and stamps. But all is not yet lost. The Post Office were forced to do an embarrassing u-turn on its ridiculous concept to rebrand itself 'Consignia' in 2001, we the public can force a u-turn on this as well. Or at least do our utmost to make it a total flop and embarrassment requiring a corrective course. The post offices everywhere are their own worst enemies. I think in the age of internet shopping they have been snoring. I, for one, would love to buy my stamps on line rather than having to visit a post office 44K from here. Seriously. They should be making it easier to use them not more challenging as is the case out here on the edge of the Atlantic. I agree with Wisewebwoman above. Sell stamps online! No more queuing for 40 minutes just to buy one stamp which then isn't enough for what you want to post because the envelope is 3mm above the correct size for a "standard letter". WWW, you are right about Royal Mail sleepwalking in the early years of internet business. And then foolishly selling off the rights of most of their burgeoning parcel business to private companies rather than keeping the ever-growing pie to themselves and providing continuity of service. Steve, you can buy stamps online. I just prefer to support my local post office. You are right about the letter size policy being a pain in the a**e though. Anyone would think they were deliberately putting obstacles in the way of postal users to deter them from using the post. It's all rather confusing. Many of the "private" parcel delivery companies which have eaten into the Post Office's business are owned by nationalised postal services in Holland and Germany. Much like many of our privatised utilities are owned by foreign government owned companies. So why is it overseas nationalised companies can be efficient, have ready access to capital etc, but ours can't and are taken over by those foreign government owned utilities. I see no reason why we don't set up a National Pillar Box Trust, bit like the NT. 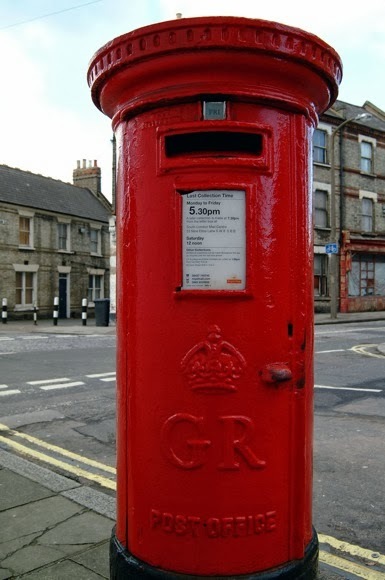 Lovely pillar boxes would be left in situ, regular manitained- polished, painted and generally regularly buffed up. People like us would join for a small membership fee and for an additional cost we could have a letter posted there and uniquely stamped.